Tim Tucker's Photography Blog: My First Ever Star Trails! 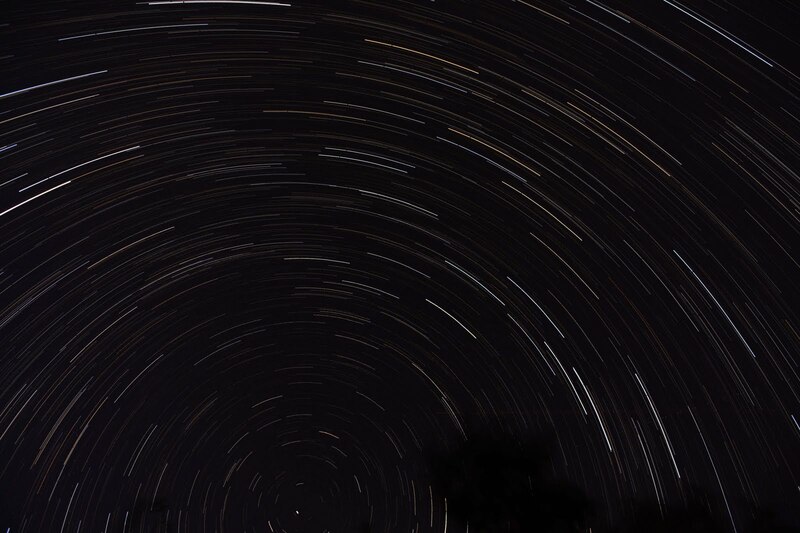 This is a composite of about 120 30 second images, stacked using a freeware application, startrails.exe (see below). Initially I was going to use the D3s built-in interval timer, but frankly it was such a faff that I gave up, stuck the camera on continuous drive and locked off the MC-30 cable release. With the shutter set on 30s on manual, it just keeps clicking every 30s until you stop it, or the batteries die! If you have a D7000, I'd advise getting the MC-DC2 wired remote - the intervalometer has a similar menu to the D3, and so it's also a pain to use. I had to take out a couple of images due to airplane light trails, that's why if you look closely you can see some small gaps in the star trails! This is one advantage with stacking, but there are others: for example, you might even getting away with swapping the battery part-way through the sequence - if you are quick - which might be handy on cold nights. Plus, if your battery does fail you won't have wasted the whole session, which you will if attempting one long exposure. Lessons learned? I normally shoot Raw, but for this jpegs are definately the way to go - you could be dealing with 100's of images from each session and although I could batch process them, this seems over-the-top for this application. Also, a ultra-wide angle exaggerates the curvature, so in future I'll be using the Tokina 11-16mm (works on full frame at 15 or 16mm). Focusing in total darkness is impossible, so you'll need to know where infinity focus is on your lens, and set it at that - or the hyperfocal distance if you have objects in the foreground (note: infinity focus is not necessarily where the infinity symbol is, and it may well change at different focal lengths on a zoom). I took a dark frame (leave the lens cap on) at the end of the sequence at the same shutter speed (30s). This helps to remove any noise from the final composite, so long as you specify which frames are 'dark' when you load the images into startrails.exe. I take the dark frame at the end, when the sensor will presumably be 'warm' and therefore at it's noisiest. It's important to have your camera's long-exposure noise reduction turned off with this technique, otherwise your camera will take a break equivalent to the length of each exposure between shots, to process the noise reduction, and you'll end up with dotted lines! Overall, I was quite satisfied with this first attempt, now that I have the technique pretty much sorted, I just need to work on composition (it would be nice to get some foreground interest).